SMT (surface mount technology) component placement systems, commonly called pick-and-place machines or PP Machine, Yamaha YV100-x is robotic machines which are used to place surface-mount devices (SMDs) onto a printed circuit board (PCB). They are used for high speed, high precision placing of broad range of electronic components, like capacitors, resistors, integrated circuits onto the PCBs which are in turn used in computers, consumer electronics as well as industrial, medical, automotive, military and telecommunications equipment. 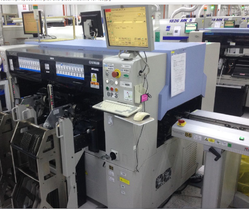 Looking for Yamaha Automatic SMT Machine for Driver Card ?